Got a party to plan? Too busy and caught up with work? Reyes Barbecue takes the lead and gets the hassle out of the way and gives a more delicious, fun and yet affordable way to celebrate! 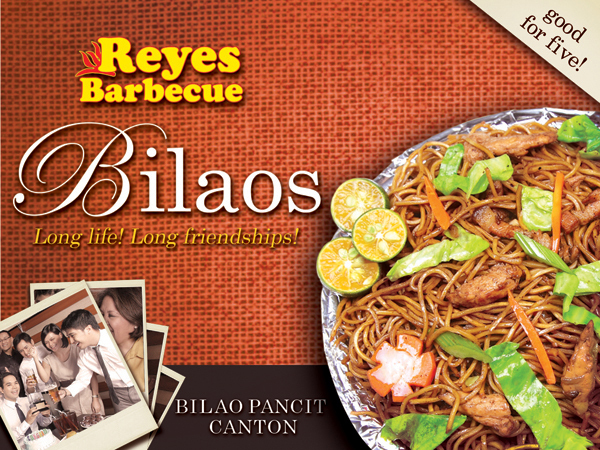 Reyes Barbecue’s latest Barbecue Party offering with their new Bilao Noodles – Pansit Canton, Garlic Sotanghon and Spaghetti – available in orders for 4-6, are ideal for those simple and yet yummy celebrations! “Noodles are an essential part of any family or group celebration, and barbecue with noodles is a meal combination everyone loves! That’s why we developed our new Bilao Noodles. We believe they complete any occasion at Reyes Barbecue,” says, Mr. Frank Reyes, Reyes Barbecue Founder-CEO. Try a delicious and satisfying party menu for a group of 10: Five 1-pc Pork Barbecue Meals, 5 Boneless Chicken Barbecue meals, 2 Bilao Noodles, 2 pitchers of Nestea, and 2 packs of Choco Merengue for dessert – all for less than P2,000! Enjoy an all-seafood barbecue party for 10! 5 Grilled Bangus Belly Meals, 3 Grilled Pusit Meals, 2 Grilled Tuna Meals, 2 Bilao Noodles, 2 pitchers of Nestea, and 2 packs of Choco Merengue for dessert – all for less than P2,500! Reyes Barbecue Party is available in the following stores: Mall of Asia, Emerald Mansion, Robinsons Galleria, Waltermart Makati, Shangri La Mall, UP TechnoHub, Nuvali, Pavilion Mall, SM Pampanga, SM Clark, SM Tarlac, SM Marilao, SM Baliwag, SM Bicutan, SM Lucena, SM Las Pinas, SM Naga - but soon to be rolled out systemwide! Barbecue. Peanut Sauce. Java Rice. Best way to go! I just love it! !